Nothing is worst than losing your luggage at the airport. Clearly identify your bags with these heavy duty rigid plastic luggage tag holders in a wide selection of colors, semi-rigid luggage tag holders, multi-textured luggage straps, genuine and executive premium leather straps, beaded luggage chains, and plastic luggage loops to keep luggage easily and readily identifiable and secure. All straps, tag holders, and loops come in a wide variety of colors for personal style and taste choices. Take a look for yourself. Ideal for travel, briefcases, golf bags, etc. This is MyBinding video. We are proud to carry a large variety of luggage accessories for all of your luggage needs. Click around or give us a call and you choose from a wide selection of options. 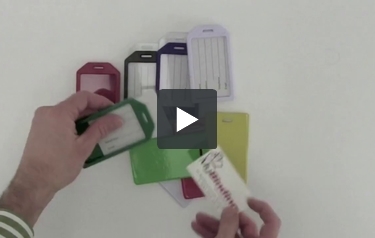 We have both heavy-duty rigid and semi-rigid luggage tag holders. And when it comes to luggage straps, we have texture as well as genuine and executive leather, we have beaded luggage chains and the ever popular plastic loop. Regardless of what you need, we have it to help you keep your luggage easily and readily identifiable. We specialize in customer service and custom orders so give us a call and give us a challenge. When image matters, MyBinding.